Artist's illustration of NASA's ICESat-2 satellite doing its work in orbit. The spacecraft is scheduled to launch on Sept. 15, 2018, from Vandenberg Air Force Base in California. A laser-firing, ice-monitoring NASA spacecraft has been cleared for liftoff. The space agency's Ice, Cloud and Land Elevation Satellite-2 (ICESat-2), which will measure ice sheets and sea ice around the world in unprecedented detail, passed a key launch readiness review this morning (Sept. 13), mission team members announced. As it zooms over Earth, ATLAS will take such measurements every 28 inches (71 centimeters) along the surface below, gathering huge amounts of incredibly precise data. Indeed, these observations will allow mission scientists to track annual height changes in the Greenland and Antarctic ice sheets to within 4 millimeters (0.16 inches), NASA officials said. ICESat-2 will therefore help researchers monitor how a warming climate is affecting the planet's coldest places. And the mission's measurements over forested country will be of interest to a range of people as well, from terrestrial ecologists to climatologists, team members said. "From the vantage point of space, we'll get a global tree-height measurement," Lori Magruder of The University of Texas at Austin, leader of the ICESat-2 science-definition team, said during a news conference today. "That allows us to create a global biomass estimate," she added. "Biomass is important, because that informs our knowledge of the carbon cycle and how it contributes to our environment and the climate." ICESat-2 follows in the footsteps of the original ICESat, which studied the planet from 2003 to 2009. But the new spacecraft, which is designed to operate for at least three years, will have much sharper eyes than its predecessor. 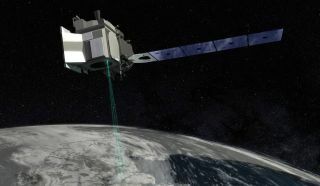 ICESat's single-beam laser instrument, called the Geoscience Laser Altimeter System (GLAS), fired just 40 pulses per second and took measurements every 560 feet (170 meters) of ground track. "As a comparison, if the two instruments took measurements over a football field, GLAS would have collected data points outside the two end zones, but ICESat-2's ATLAS would take measurements between each yard line," NASA officials wrote in an ICESat-2 mission description. Saturday's launch — which will also loft four small space-weather cubesats — will be the last for the venerable Delta II. The rocket debuted in February 1989 and has 154 missions under its belt to date, the last 99 of which have been successful. The 128-foot-tall (39 m) Delta II has launched many important payloads over the years, including NASA's Kepler and Spitzer space telescopes, Spirit and Opportunity Mars rovers, Phoenix Mars lander, and Dawn probe, which is currently orbiting the dwarf planet Ceres. "The Delta II vehicle has touched the life of probably every single person in America in the technology that it has enabled over its 30 years," Scott Messer, program manager for NASA programs at ULA, said during today's news conference. "It's been a very, very prominent part of space history and a very important part of probably everyone's life in America."